All of the rooms at the luxurious Southern Sun Hotel have stunning views of either Table Mountain or Cape Town Harbour and Table Bay. This Cape Town central accommodation comprises of 398 rooms comprising 14 Executive Suites, 2 Penthouse Suites, 2 Presidential Suites, 334 Standard Rooms and 16 Suites. These consist of non-smoking king-bed rooms, non-smoking queen standard rooms, executive king smoking rooms, king-bed smoking rooms, a wheelchair accessible room, presidential smoking suites, smoking and non-smoking suites with king beds, twin bed rooms, executive queen rooms, twin beds with sleeper couch rooms and there are 2 penthouse suites. 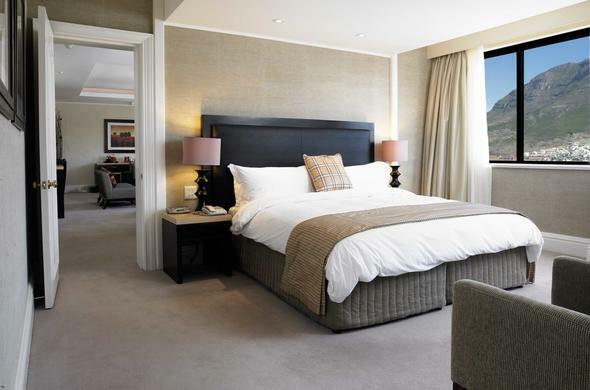 All of the rooms have stunning views of either Table Mountain or the Harbour and Table Bay. They also have air-conditioning, colour television sets with selected satellite channels, direct dial telephones, safes, coffee and tea making facilities, hairdryers, private bathrooms, work desks with lamps and WiFi Hotspot connectivity.